Last night, we attended an outdoor concert by the Detroit Symphony Orchestra and the U.S. Army Field Band, complete with fireworks and real cannon fire during the 1812 Overture finale. 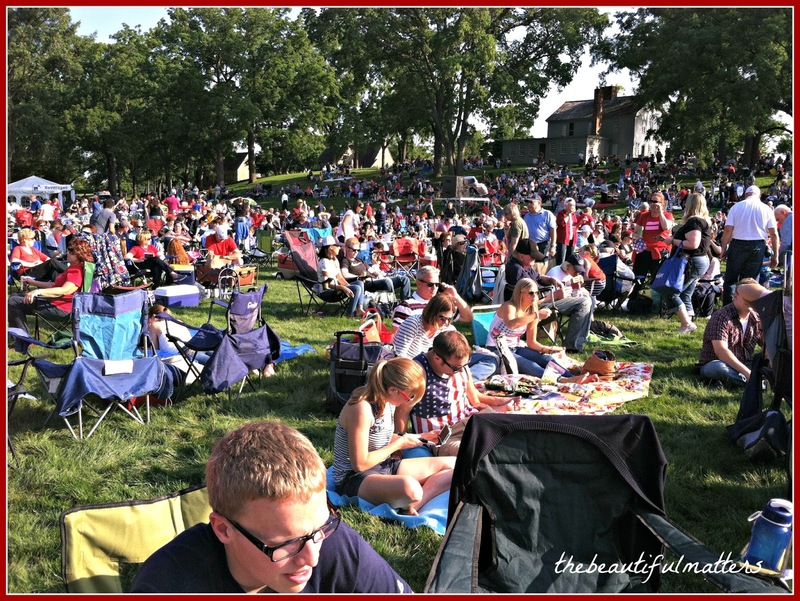 We went early, with hundreds of others, to picnic on the grounds of historic Greenfield Village. 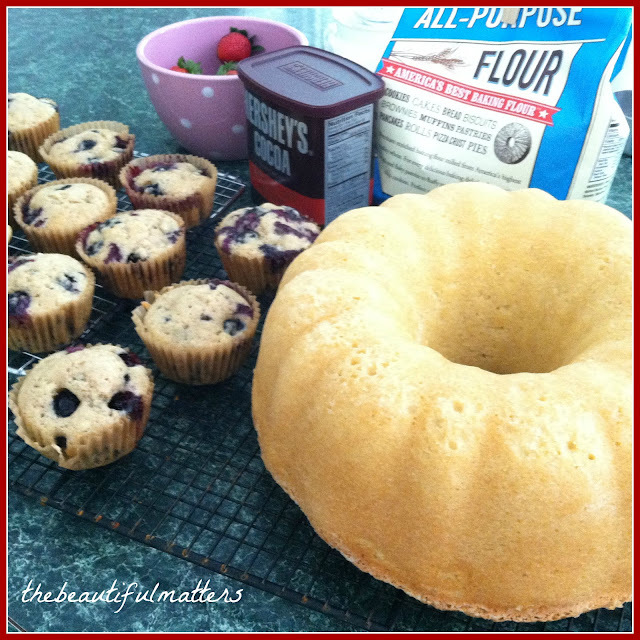 Old-fashioned pound cake and blueberry muffins were on the menu . . .
. . . as well as fried chicken, orzo pasta salad, fruit, and vegetables and dip. A thermos of coffee kept us warm as the sun set and the air cooled. We joined in singing many of the old, beloved patriotic songs, and ended with a chorus of God Bless America. A surprising (given the current climate) and blessed antidote to some of the very hard news lately. We are off to see more fireworks tonight, and then up early to watch the parade. Hope you all have a wonderful weekend. *** Don't forget to leave a comment to be entered in my giveaway. Let me be the first, if I may, to let you know how much this post touched my heart. I may be a citizen of two countries (US and France), but this country has given me and my family so very much for which I am so very grateful. American GIs liberated my French father from a German prison camp at the end of WW2. It was the beginning of his love affair w/this country. I proudly display the American flag on national holidays. What a great evening that must have been! Unfortunately, most of our local festivities have been rained out...even calling for more rain tomorrow :( Enjoy the rest of your celebrations this weekend! What a great time that must have been. I love your photos. Enjoy the remainder of the weekend. 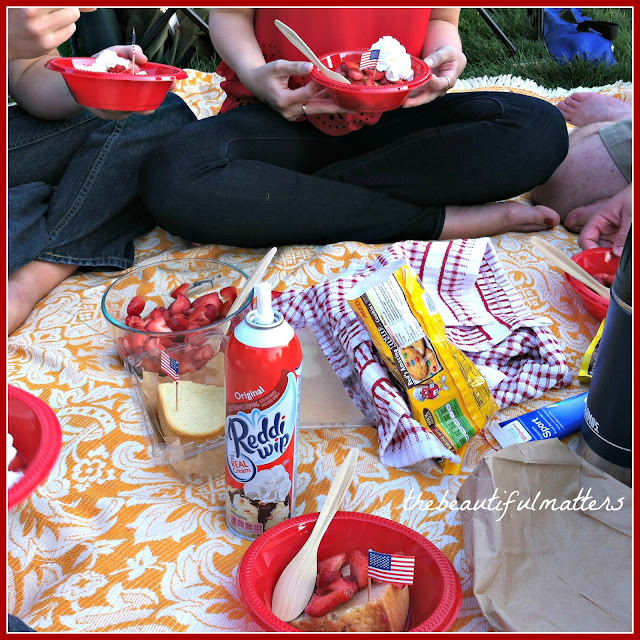 Your whole picnic and concert sounds like the perfect antidote to the gloomy news lately. I never cease to thrill to hearing the 1812 Overture played! I would love to hear the 1812 Overture finale with live music being played - WOW! Happy Independence Day - enjoy! I loved seeing your photos and reading this post. I got a wonderful spirit of community togetherness. Happy 4th to you and your family. I'm Canadian/British and in England right now, but I did fly my Canadian flag on the 1st. What a lovely evening and to have sung God Bless America would have had me in tears. Hi Deborah, what a wonderful evening. Greenfield Village is practically in my old backyard. I love it there. Great pics of the fun and food! Enjoy and have a wonderful 4th of July. Sounds like a great evening. Hope you enjoy the rest of your celebrations. How fun! We used to do that with friends every 4th in one place we lived...so much fun and so heart warming! 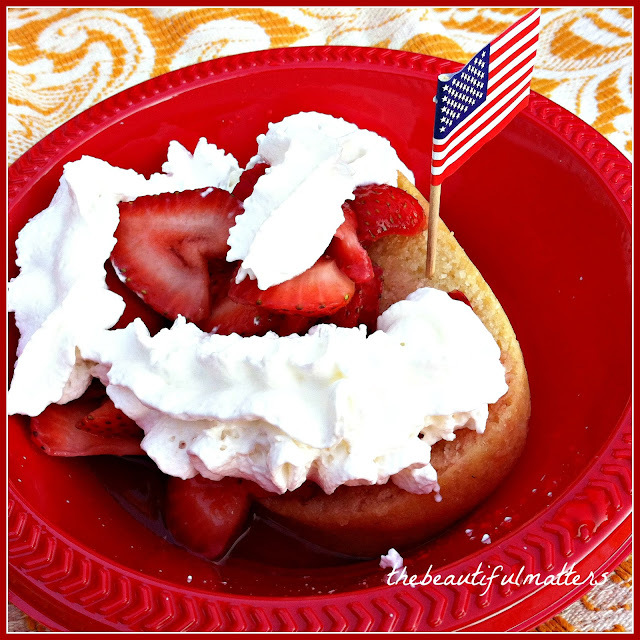 Lovely way of celebrating the 4th of July in Grand Style and with good food. Happy for you and yes, it is refreshing to be able to sing along with God Bless America and we need that blessing more than ever! Hugs and happy ending of your 4th of July. Ours was great as well, with a potluck lunch with friends near the river. Oh Deborah, wht a beautiful time that must have been for you and your family! I hope you had a blessed 4th of July! Hugs to you! A good old-fashioned celebration and it warms my heart to think that God Bless America was sung. That looks and sounds like something I would have liked, how fun! I bet the chorus of God Bless America was absolutely beautiful! We must keep our Nation in our prayers and keep remembering, as hard as it is sometimes, that God is in control. Real cannon fire! That's exciting! And your celebratory dessert looks amazing ... well done! Glad you had a great time. What a fun time that must've been, Deborah! We even sang two patriotic hymns at church yesterday. I'll bet your dessert was delish!